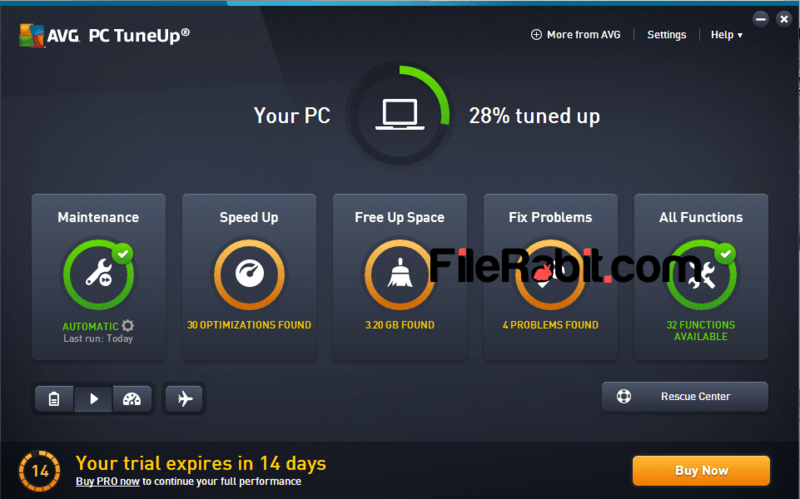 AVG PC TuneUp can boost computer performance with fixing registry entries and cleaning broken shortcuts and also optimizing major parts of operating system. It makes your computer work faster than ever before with tuning up the system with performing several actions. Windows Registry is the main key program which can operate OS with internal entries. There are many causes that makes your PC slowing down e.g. unexpected electric load shading, unexpected shutdowns, virus or spyware attacks, windows hanging and stuck issues as well. AVG PC TuneUp will maintain the system flow with fixing corrupted, deleted, fake and harmful entries. Moreover, system cache logs, internet browser data, broken shortcuts, windows logon and shutdown problems, disk fragmentation and maintenance as well. After installing, it will scan whole PC for errors and issues. Clean temporary files and browser cache data to speed up old computers and stop unknown programs from eating system resources. It will also delete any junk files found in system to keep the workflow of OS in perfect position. A auto maintenance run will check bad issues after 3 days and will fix them automatically. Different tools have different usage but the raised point is everything is easy to use with simpler graphic interface. Previously TuneUp Utilities is another awarded software that offering similar features but that is too expensive to purchase. The software will find different ways to to speed up computer with fixing troubleshot, temporary files and registry entry issues. However the dashboard of AVG PC TuneUp shows Maintenance, Speed Up, Free Up Space, Fix Problems and All Functions. Each of category includes different problems and their solutions inside TuneUp software suite. It will increase the health of PC, make it faster, increase battery timings and the major one is saving money. Furthermore, there are dozens of other programs including Task Manager, System information, Disk Explorer, Services Manager, Duplicate File Finder, File Recovery, File Shredder, Track Eraser, Internet Optimizer and more. There programs and utilities are enough to make computer faster than ever before. Save money and time with running daily maintenance service to ensure maximum speed and performance.